In the carnival city of Elysia, the land of youth, life is a sweet excess of costumes, parties, food, drink, and debauchery. Four friends live together there and play in a band called Ecstasia. Then their drummer, Rafe, falls in love with a tight-rope walker who has a secret linking her to Underground, where the elderly are banished. Their doomed romance drives the entire band to explore the shadows hidden beneath the city and in their own hearts. I read Ecstasia for the first time in middle school, and completely fell under its spell. I carried it with me nearly everywhere I went. I wore through three copies in nearly as many years — as you can see, my current is still ragged and dog-eared, the binding coming free. I read it so many times that I still have certain passages almost memorized. But why did it have such an impact on me? Today, I can see that Ecstasia plucked nearly all of the archetypal strings that sound the music of my personal mythology, as well as hitting a few of my bullet-proof narrative structures. Many of the stories I’ve loved, be they books or movies, have included the archetypal setting of Underground. As a child, I had recurring dreams about discovering an underground landscape beneath the ranch where I grew up. As a young adult learning to cope with clinical depression, I fixated on the Persephone myth. Through it, I learned to view my dark melancholy periods as my equivalent to Persephone’s descent into Hades each autumn, and to trust that spring’s warmth and my own trickster spirit would eventually draw me back into the sun. Ecstasia’s Underground is thickly-tangled with allusions to Hades, as in this section, which calls forth Orpheus’s taming of Cerberus. That was when he saw the dogs again. Their yellow eyes flashed and their jowls quivered as they scrambled forward. And Rafe remembered the boat man’s bone flute. His hands fell upon the drum slung over his shoulder. It was a stark rhythm Rafe played, echoing against the buildings as it tried to escape the confines of that city beneath the earth. He leaned back, sucked in his lips and cheeks, and shut his eyes to the approaching pack of fur and teeth. His palms showered down again and again, flat and callused on the skin of the drum. His whole body responded to each beat, but he did not turn and run — stood half-waiting for the ripping and snarling animals. Instead, there was a whimpering, a pained whine and scuffling at his feet. The dogs cowered there, some flattened against the stones with their paws pressing on their skulls. A few still bared their teeth, but most looked toothless, beaten, broken by the music that came from that drum, those hands. When Rafe started to walk through the streets, they dragged themselves after him. How could I resist that as a young girl, already fascinated by classical mythology? Rafe, as the young drummer, adds an uncertain, vulnerable layer to the Orpheus character descending after his lost love. Her ability to breathe new life into ancient archetypes is one of the many reasons I love Francesca Lia Block’s writing, in this and all of her books. And of course, I still love her prose, which is nearly kaleidoscopic in Ecstasia, third-person limited giving way to third-person omniscient, to poetry, to stream-of-consciousness, yet structured so each change makes perfect sense. Each passage sparkles with imagery; concrete details presented one after another, sometimes in surprising combinations, until her writing feels as dazzling and dizzying as the streets of Elysia themselves. And though I think Ecstasia is best when the reader finds it in the flush of youth, to this day, it continues to delight me, although now my visits to Elysia are always tinged with melancholy, as always happens when re-visiting a favorite childhood haunt. 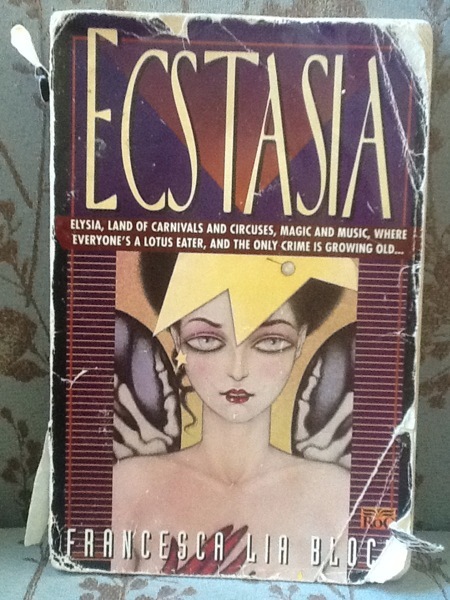 “Each passage sparkles with imagery; concrete details presented one after another, sometimes in surprising combinations, until her writing feels as dazzling and dizzying as the streets of Elysia themselves” perfectly expresses this feeling I have as I am half-way though reading Ecstasia for the first time at 19 years old. I am so dizzy with resonating with her words that I had to take a break from reading and research the author. Dizzying is definitely the right word to use! I remember feeling that way when I first read Ecstasia. I’m glad to meet someone else who enjoys it!